Please deliver to.....: Are you alive? Prove it by sending some mail! Are you alive? Prove it by sending some mail! You know how some websites require you to do a word verification in order to leave a comment? You write your pithy message, and up pops the word verification stating, "Please prove you're not a robot." I find this inordinately annoying. Does the internet know nothing about robots?! Because hello: ROBOTS CAN TAKE OVER THE WORLD. I'm pretty sure reading words on a screen isn't going to stump them. Oh, I can hack into the nuclear defense mainframe and the entire world wide web and make human beings into my little flesh slaves, but having to input the words "24 attyimiga" into blogger is so complex and I cannot compute and systems shutting down now..... Clearly the internet needs to learn about cylons. And watch any science fiction movie about robots ever. So the point is: the ability to input the words doesn't prove you're human, robot, anthropomorphic cheetah, or anything really. Plus, I'm not even sure I'm not a robot. Because if science fiction has taught me anything, it's that the people who think they're not robots often end up being robots. It's the good, old sleeper-robot trick. So because I'm such a smarty-pants, I just go around thinking that I am a robot. I'll use reverse psychology on the robots to convince them that I am a robot so that I won't be a robot.... wait, what?! I'M CONFUSED. I think I need to go in for servicing and maintenance. My circuits are fried. And the word robot is starting to look weird to me so let's move on, shall we?! Marissa just finished going on a huge European cruise (two of them, actually!) and sent me postcards from the awesome places she visited, such as the one below from Pompeii (she also sent the one from Dubrovnik last week). IT'S NOT FAIR. I WANNA GO TOO. So from now on: if you go anywhere awesome, you have to bring me with you in your suitcase! I'm taking any replies to my letters from now on as agreement of these supposed-to-be-implicit-but-I-am-making-them-explicit-so-there's-no-confusion freaky deaky terms. Oh, and by replying, you also waive the right to be creeped out. Thank you and have a nice day!! Kay sent a letter to my gunslinging alter ego: Johnny Quickdraw Dylan! That's me! When I'm not being Lady Laura, of course. Apparently I'm wanted for the terrible crimes of rustling cattle and abusing post scripts. WHY I NEVER! I would never rustle cattle! But I do abuse post scripts so hang me, ma'am, if you must. Kay also sent these fantastico, awesomesauce, velociraptor-iffic Marvel buttons. LOVE THEM SO MUCH. It must be Marvel week for me because Natasha also sent some great Marvel stickers in her Hellboy envelope above. I <3 <3 <3 my penpals; they are seriously the best of the best of the best. And that's it! I'm out. Have a great week everyone. Remember: I AM NOT A ROBOT. Haha, Laura I'll keep that in mind and FYI I am not a robot either! :) I find that word verification thingy seriously annoying too. And do you know that when I typed the word "velociraptor-iffic" into Google Search, the link to your blog kept popping out?! Have a great weekend! I hate when the comment does that stuff to me too, I sometime get the words wrong so does that make me a robot. Also even if you get the word wrong you can try over and over again. I like the net post cards you got there, I really love the bear super cute\cool. I also love the letters your getting there so very net looking a lot. I responded to your letter today!! I HATE CAPTCHAS!!!!! GRRRRRRR!!!! I bet robots could actually do captchas because they could scan them and figure out algorithms and such. Buh. Hahahaha! Laura! You're so funny! :P I hate, hate, hate those things, too! Geez, half of the times I can't tell what letters and numbers I'm supposed to type. Sometimes, I just give up on leaving a comment because of that. And awesome mail! I'm working on your letter today ;). Have a fun week, girl! Hi laura! I've just sent you a letter! Hope you'll recive it soon!! Laura! You were in my dream last night! We lived in the same apartment complex and I only remember half of the story now, but it was such a weird dream! I remember you leaving a coded message on your answering machine for me to uncover some mystery... Ha! If I remember anytyhing else, I'll let you know! 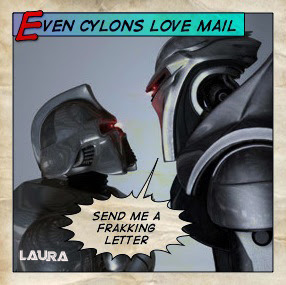 I think Laura may have been kidnapped by the Computer Robots she angered with this post!!!!! Has anyone seen her? Gold Medalist in Zombie Survival!